From time to time, I rather go fly fishing on my own. I love to venture along a stream, not knowing what lies behind the next bend and immerse myself fully into the wild. Given my solitude, I barely take any pictures. This two days fly fishing trip into the unknown was one of those solo adventures and therefore has no fish pictures. Sorry guys – illuminating lecture though! On a rainy Friday morning, I packed my backpack and took off for a two days fly fishing trip into the unknown. I had never fished before in this river. Yet, I had a glimpse at it already while I drove through this region a few months earlier. Back then, I decided to head to this bubbly small mountain river, which looked very promising to me. Now, I was finally on my way by train, bus and foot until I finally reached this river. If you want to know about the gear I used, you will find a post with my packing list here. The river I was heading to, could as well be called a creek. It measured in average about 3 to 4 metres in width and therefore is rather small. Additionally, there was a lot of vegetation around this creek. Low hanging branches and trees lying across the river bed made casting quite demanding. Nevertheless, I was really looking forward to venture on this two days fly fishing trip into the unknown and follow this little creek as far as possible. I left the bus at the closest station to the river. Still, I had to walk about two more kilometres. The weather was cloudy and from time to time I felt a few raindrops. Hopefully, it was not going to rain, I thought. Or at least not as a downpour. Although I was prepared for rain as you can see in the packing list, I rather enjoy dry weather. Especially, while camping. However, the weather forecast was very unreliable because of an unstable situation. When I arrived at the creek, I changed my clothes to wading equipment. Now I did not mind the rain anymore, because in my Taimen Waders and Taimen Wading Jacket I am pretty well protected. I put the Scott A4 #6 9’ fly rod together and began finally fishing on my two days fly fishing trip into the unknown. 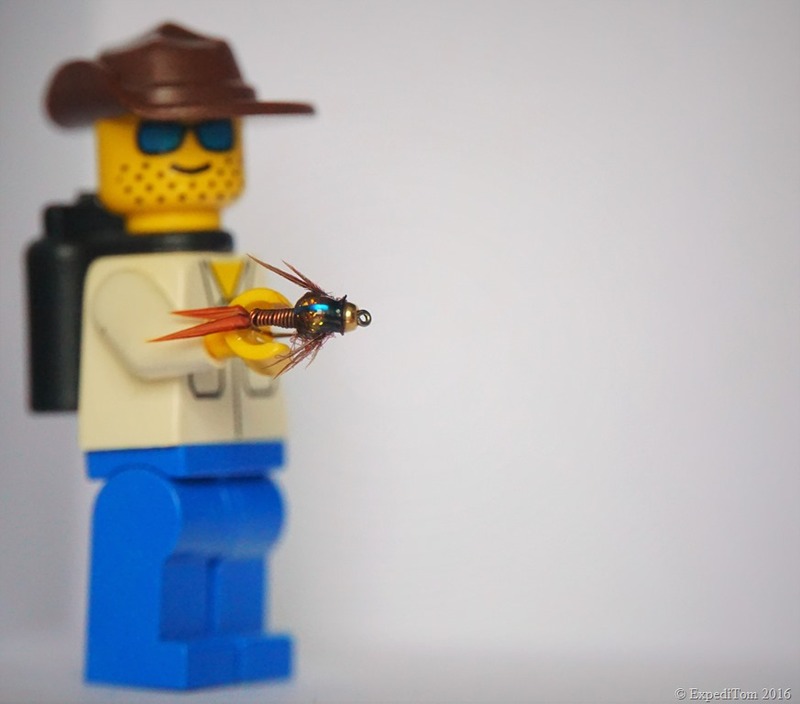 I started fly fishing with a dry-fly dropper rig. Thereby, I used a Royal Wulff and a small gold bead nymph like the Copper Tom. The reason why I chose to fish a dry and nymph combo was, that I did not see any fish feeding on the surface. Thus, it was kind of a try and error method, to find out what works best at this river. While venturing upstream, I saw several promising looking spots. Soon, the first few small trout swam away, spooked by approaching not carefully. It proofed to be very difficult to read the water where the trout hide, when you are the very first time in new water. However, I tried my best and observed the water more thoroughly to avoid spooking other fish. A larger stone lay in the middle of the creek. On its left, there was some wood stuck and formed a small natural dam. On the right of the stone, there was subsequently more water passing through and the rapid was stronger. Behind the stone the water formed a swirl as well as a little eddy, which measured not more than 50 centimetres in length. I stood about 4 metres downstream from the stone. I casted my rig in front of the stone to let it float freely into the eddy, where I expected a trout to be. Yet, the trout was not interested in the nymph. Due to the swirly water, I did not even try to mend, but rather was just keeping the rod as high as possible. This so-called “high-sticking” technique allows to keep line out of the water to avoid dragging. 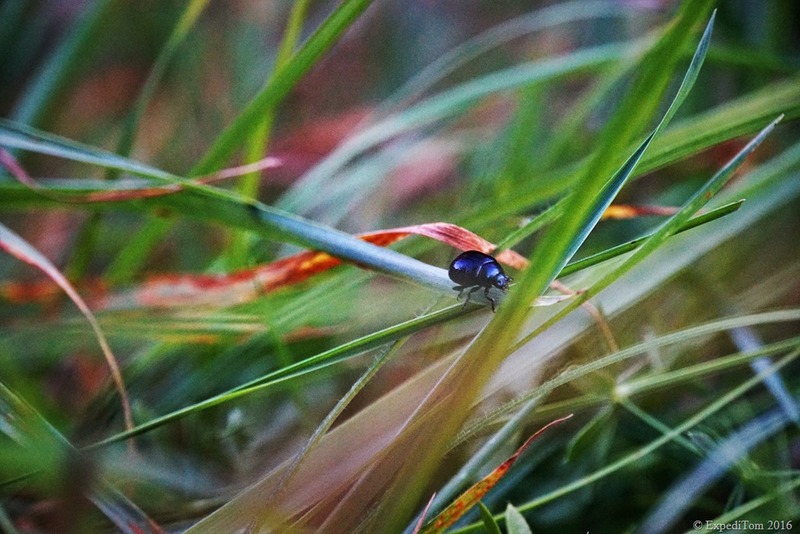 Furthermore, it enables to feel bites better due to the improved contact to the nymph. 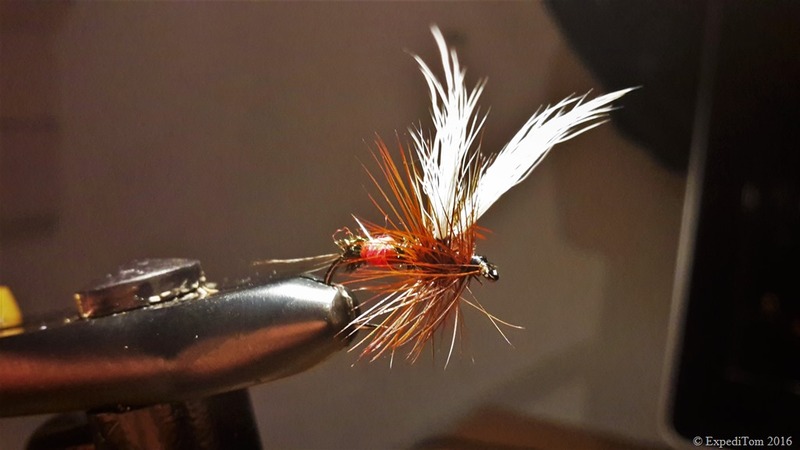 If I had not used a dry-fly-dropper rig, this technique could have possibly been called ‘french nymphing’. Yet, the trout was not interested in the nymph. A sudden splash on the surface stretched my line. The trout tried to disappear under the wood on the left hand side of the stone. I put tension on the line to pull the fish in the opposite direction. It worked. Another jump and then the trout gave in. Wow! What a fight for such a small trout, which then was gently released. After having caught the first trout on the dry, I was relieved that my method worked. Moreover, the first fish in an new river is always an extraordinarily pleasing satisfaction. I continued my sojourn and clipped the nymph in order to only fish with the dry fly. I fished with the dry fly rig for at least another hour without having had any noteworthy action. Thus, I changed again to the nymph. The tiny gold bead nymph was more successful. In particular, when presented close to the washed out banks with the roots of the trees. Several trout came to the net. Most of the few trout I caught were very small. This fact astonished me. The river has a very natural finish without artificial dams and deep pools. Moreover, the banks are washed out and offer plenty of hiding places. My only explanation to the meagre catches was high angling pressure – or my incapability of cracking the code of this river. Or a combination of both. It was now 4 hours ago that I started fishing the creek and I began to feel tired. I realised that I had forgotten to eat anything. If I had not used a camel back, I probably would not have even drunk anything either. Subsequently, I kept looking for a suitable camping spot. Shortly after, I found a lovely looking spot. 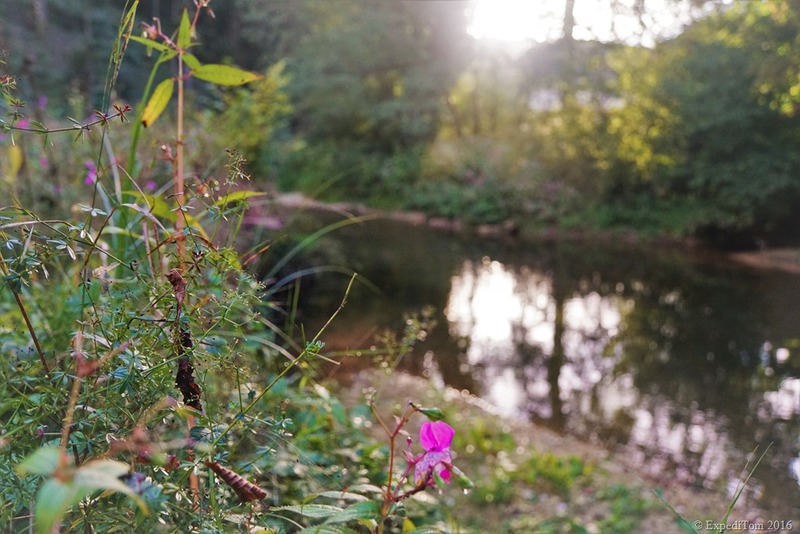 It was in a bend where a meadow was next to the river with easy access to some gorgeous pools. That is my kind of camping. 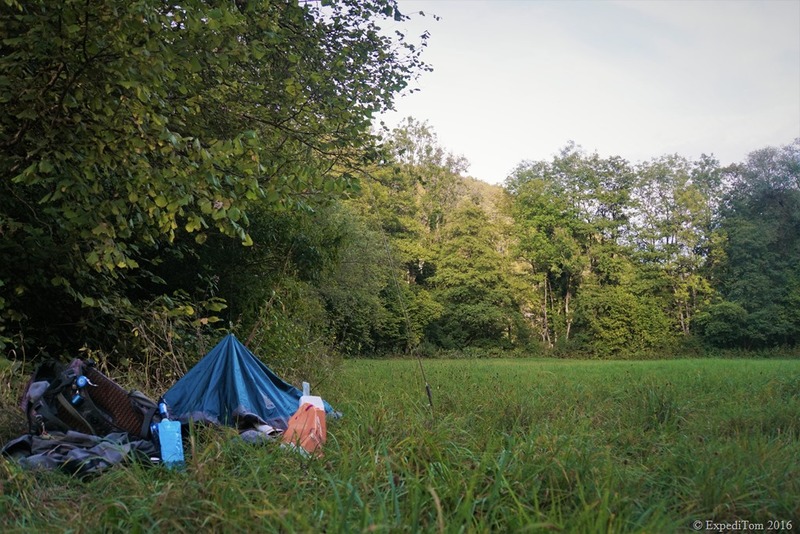 I unpacked my sleeping setup consisting of Sea to Summit Spark II Sleeping Bag, Thermarest NeoAir Xlite Sleeping Pad and Outdoor Research Aurora Bivouac Sac. Having finished unpacking, I cooked my dinner which consisted of a dehydrated couscous with a can of tuna (MSC). The water was filtered from the river with the Sawyer mini water filter and I boiled the water with the LACD Gas Stove Ultralight Titan. After having washed my dishes, I returned to the river. I went to the pool where I had finished fly fishing before dinner and had lost a decent trout. I sat on a stone at the river bank and observed the surrounding. It is these rare self-enriching moments fly fishing is all about – not the fish. The birds were singing and a kingfisher even flew right beneath my rod. What a beautiful bird. There was only nature and myself. I loved this solitude and felt delighted to witness this magical moment at the river. At some stage, I recognised some trout gently sipping mayflies from the surface, but I decided not to try to catch them. Preferring just to sit there and enjoy the moment. I was fully immersed in a moment, which seemed timeless to me. 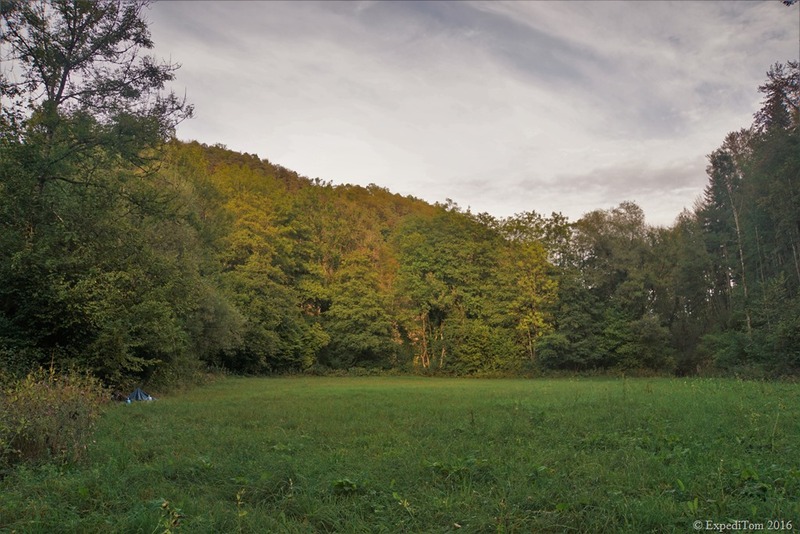 Without having fished the evening rise, I went back to my camping spot. I checked the weather forecast again. It had changed. The downpour should start the following morning at 10 o’clock. I slipped into my cosy Meru inlay sleeping bag and soon fell asleep. The morning was chilly and I was glad I had taken my outfit into the sleeping bag. This warms your clothes during the night. It is much more convenient to put on warm clothes, rather than cold ones. Moreover, I was glad that I had put the gas cooker with some filtered water close to my bivouac. Thus, I prepared my breakfast while still lying in my sleeping bag. I boiled water for some tea and poured some cold water into the dehydrated muesli by Bla Band – the best outdoor muesli I have ever had! hmmmmmmmmm. After breakfast I packed my sleeping setup and as soon as I had finished, raindrops began to fall. Lucky me. I put on the backpack, covered it with the rain fly and continued my two days fly fishing trip into the unknown. I still fished with an indicator nymph rig and soon caught another small trout. Another particularly large pool, I observed concisely before getting closer to it. The pool was about one metre deep and must have had the Mama trout in there at some point. I casted at least a hundred times and 98 times the nymph drifted superbly through the pool, but no trout bit. The other 2 casts I hooked a branch above me and lost 2 flies. Bugger. Neither changing the depth nor the fly was successful. I suppose that the reason I did not catch anything was the good accessibility. It was a piece of cake to get there. A dirt trail followed from the meadow to this great fishing spot. Therefore, I assume it must be a quite popular place to fish. The river then run through a small village. Urban fishing is not my cup of tea. Thus, I decided to skip this 2 km stretch and jumped into the river again where it left civilisation. On the other side of the village, the river was even more overgrown. Sometimes, I stood in chest deep water and had to carry my backpack above my head. Otherwise, it would have been totally wet. Memory for myself: A waterproof pack is still on my wish list. 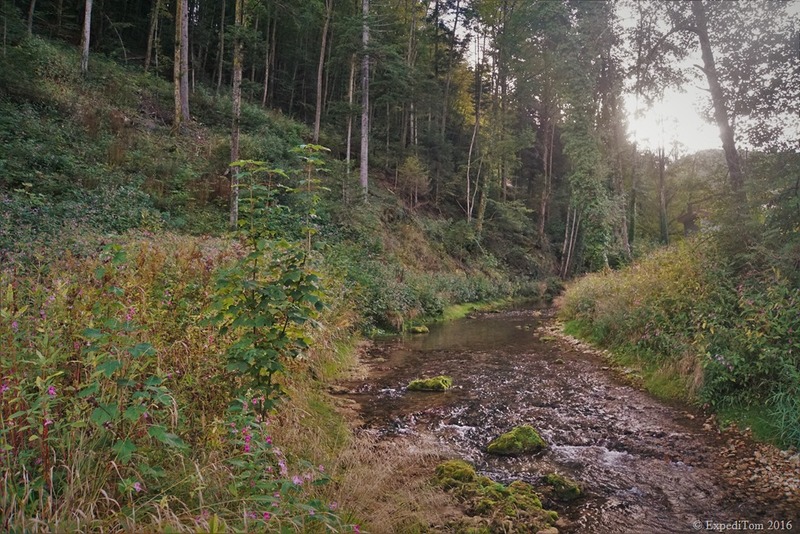 I still wondered why this river, which in comparison to the Jura mountain creeks has deeper pools and more water, does not produce larger fish. Furthermore, I caught fewer fish, the further I went upstream. Nevertheless, the water was gorgeous and had some good-looking spots. I arrived a bit exhausted at a small clearing with a fireplace. Again, I forgot to have lunch and was very hungry. Thus, I left the river and sat on the trunk next to the fireplace and ate my remaining food supplies. I thought about the trip and was pleased with its outcome so far. Everything went well. 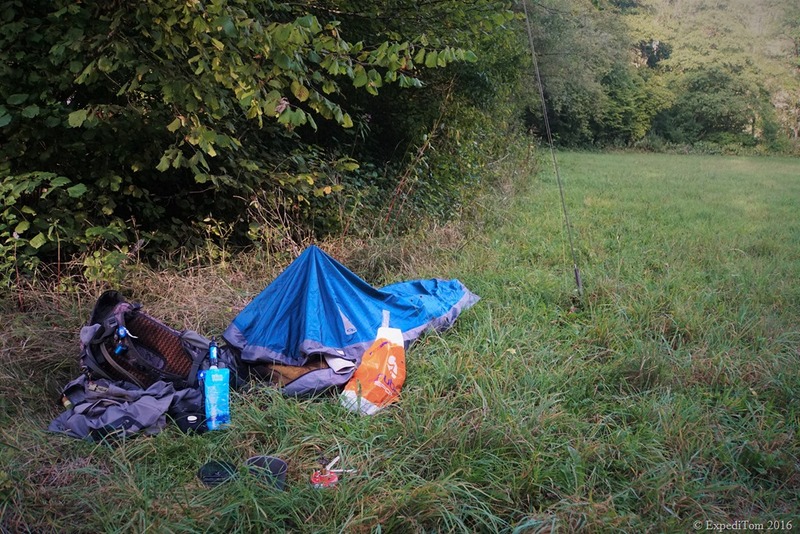 I had successfully been fly fishing in a new river, was camping in a bivouac and was extremely lucky with the weather. A short moment, I considered walking further upstream. But I decided to have a look at the map first. Although, I thought the stretch of water could be easily covered in two days, I realised that there was more than 1/3 left. In consideration of the advanced time, I decided to head back and explore the rest of the river during another two days fly fishing trip into the unknown next year. The two days fly fishing trip into the unknown was a great experience. I fly fished for self-enrichment and this requires solitude. I found this solitude at this remote river. Enjoying this beautiful moment close to those elusive trout, was amazing. However, neither the size nor the amount of fish was very impressive. Nevertheless, I will return to this river to explore the remaining part. I learned that it is necessary to approach an unknown river even more careful because I walked too close to some really good looking spots. Reading the water more thoroughly might result in larger fish. I caught fish on dries, but more trout were hooked with a nymph. Actually, I remember only one fish being caught on a dry right at the beginning. Several more trout were hooked on the nymph. You will find more take aways about this trip with a focus on outdoor related topics such as camping in the post about the packing list for this fly fishing trip. Have you ever been on a multi day fly fishing trip? What was your experience? Any advice?